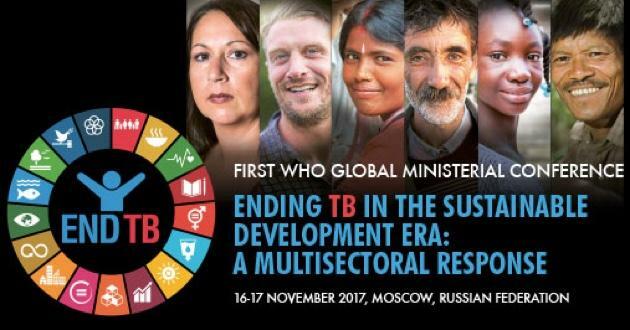 Ministers, leaders of UN organizations, NGOs, high-level representatives from civil society, academia and the corporate sector, will gather in Moscow on 16-17 November 2017 at the first WHO Global Ministerial Conference to end tuberculosis (TB). On the first day the Minister of Health of the Russian Federation Veronika Skvortsova, the WHO Director-General Tedros Adhanom Ghebreyesus and the WHO Regional Director for Europe Zsuzsanna Jakab, will address the conference. Hosted by the Ministry of Health of the Russian Federation, the Ministerial Conference “Ending Tuberculosis in the Sustainable Development Era: A Multisectoral Response” aims to accelerate efforts of all WHO Member States in taking effective measures to end the global TB epidemic by 2030, through a multisectoral and interdisciplinary approach within the Sustainable Development agenda. Ministers of Health and Ministers from other sectors will take part in the conference, including from the top 40 highest TB and Multi-drug-resistant TB (MDR-TB) burden countries, as well as the leaders of UN organizations, development agencies and regional bodies and nongovernmental organizations, including faith-based organizations, civil society representatives, affected people and communities, academic and research institutions, philanthropic foundations and private sector entities. TB carries a grave global toll having been one of the top 10 causes of death worldwide in 2015, causing 1.8 million deaths, including 0.4 million among people with HIV. In 2015, there were an estimated 10.4 million new TB cases worldwide. The public health crisis of multi-drug resistant TB (MDR-TB) continues. Although 49 million lives have been saved through global efforts since 2000, actions and investments fall far short of those needed to end the TB epidemic. Countries need to move much faster to prevent, detect, and treat TB if they are to meet the global targets. This requires multisectoral action across the Sustainable Development Goals (SDGs).